New school buidling now open! Children in school had their excitement doubled on Friday, 4th November as the community turned out for the official opening of our new school building. To their great delight, the ribbon was cut by their story time hero, the Gruffalo! 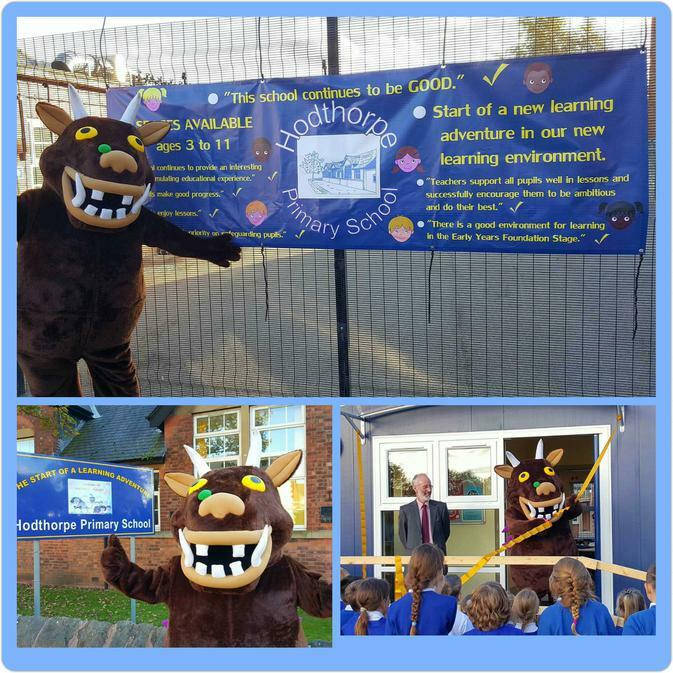 Helped by chair of Governors, Robin Penny, the Gruffalo not only opened the new building, but visited all the children in class as they got on with their afternoon's work. Parents and friends joined in the fun as the school was given over to an open afternoon to enable everyone to take a good look at the new facilities and sample refreshments on offer. The new classroom is accompanied by a well fitted kitchen to promote healthy eating and provide cooking facilities for the children. There is also a meeting room and sensory room to add to the already top class facilities available to all children at Hodthorpe.